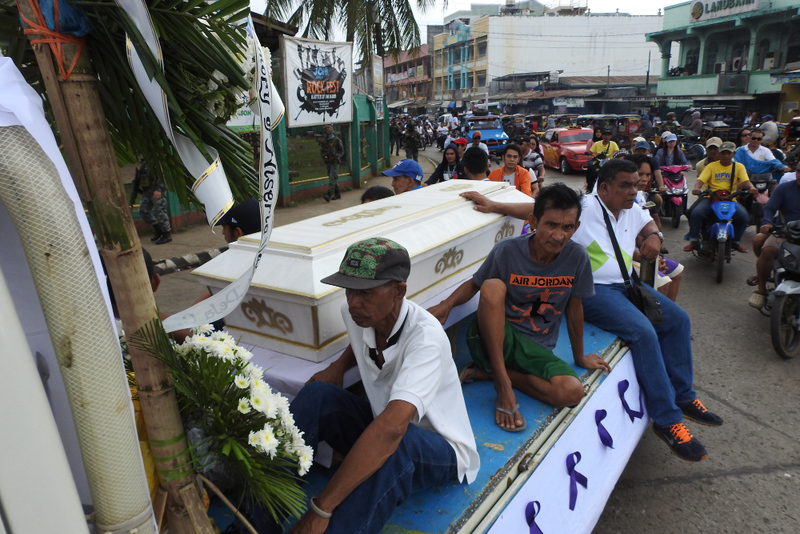 Mourners ride on a hearse during the funeral procession of a victim killed in the January 27 cathedral bombing in Jolo, Sulu province on the southern island of Mindanao, Jan. 30, 2019. Five Filipino soldiers and three Abu Sayyaf gunmen were killed in a clash Saturday, as Philippine troops intensified their manhunt for militants behind twin explosions that left 22 dead at a Catholic church in southern Jolo island. Lt. Col. Gerald Monfort, spokesman of the Army’s Joint Task Force Sulu, told reporters that a heavy firefight erupted before noon between the 5th Scout Ranger Battalion and about 150 Abu Sayyaf fighters near the town of Patikul. The soldiers were on the hunt for Hatib Hajan Sawadjaan, an Abu Sayyaf commander known to have ties with foreign militants, near the village of Kabban Takas. Monfort said the intense fighting the led to the deaths lasted for nearly two hours. At least 15 other militants were believed wounded. “The pursuit operation against the enemies are still going on,” regional military spokesman Col. Gerry Besana told BenarNews, adding that residents were evacuated to safer grounds. Besana said the militants’ leader, Idang Susukan, was wounded along with some of his men. Sawadjaan is an Abu Sayyaf leader believed to be involved in the bombings at the Jolo Cathedral on January 27 that left 22 people dead and more than a hundred others wounded. President Rodrigo Duterte had blamed “suicide bombers” for the attack, saying that the Abu Sayyaf worked in concert with the Islamic State. Investigators have said that the bombers included a woman, who detonated the bomb inside the church. Their nationalities have yet to be ascertained, after Interior Secretary Eduardo Año claimed that the bombers were Indonesian, citing intelligence sources. “The purpose of the couple is to set an example and influence Filipinos to become suicide bombers,” Año stressed. The first bomb detonated during Mass and the second blast followed in a parking lot as soldiers responded. The attack that also left 110 wounded was the most brazen in recent years and came at a time when thousands of troops had been deployed to Jolo to crush the militants. Two days after the blast, unidentified men lobbed a grenade inside a mosque in the nearby city of Zamboanga, killing two Muslim religious leaders and wounding four other people, in what some officials fear could be sectarian violence. The entire south remains under military rule, imposed by President Duterte two years ago after Isnilon Hapilon, an Abu Sayyaf commander who became the Islamic State head here, led a group of fighters from Southeast Asia and the Middle East in taking over Marawi city, also in the south. The five month battle finally ended in October 2017, with the death of Hapilon and key leaders of the siege. But remnants of the fighters who fought in Marawi had escaped and are known to be trying to boost their ranks by recruiting younger fighters.